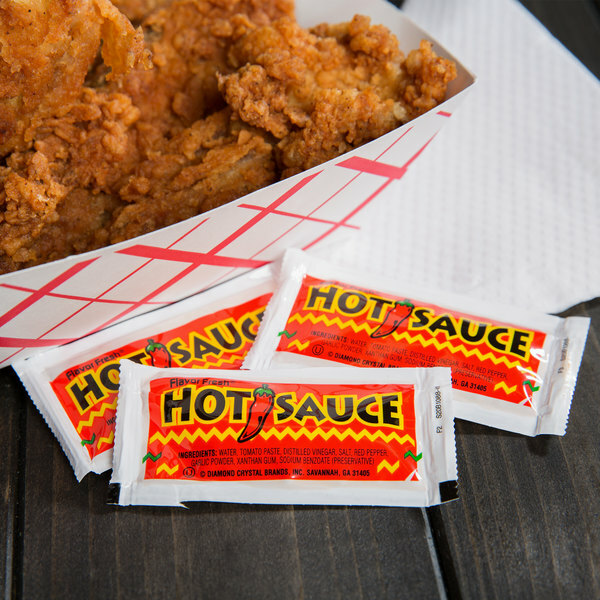 Hot and spicy, this delectable hot sauce will deliver just the right amount of fiery flavor to your customers' food. These 3 gram portion packets are ideal for any restaurant, diner, convenience store, cafeteria, or take-out station and offer a quick and easy way to enhance profitable menu items. This spicy sauce is perfect for any grilled meat, and is also great for enhancing popular fried foods such as wings, chicken tenders or nuggets, French fries, and more with a peppery kick of flavor. Bursting with bold spiciness, this sizzling-hot sauce is the perfect blend of fresh-from-the-vine-tomatoes, fiery red peppers and savory garlic. Beyond its use as a classic dipping sauce, this hot sauce is a delectable addition to any creamy dressing. Whisk the perfect portion of hot sauce into ranch to spice up salads, or spread it on sandwiches for a spicy zest. 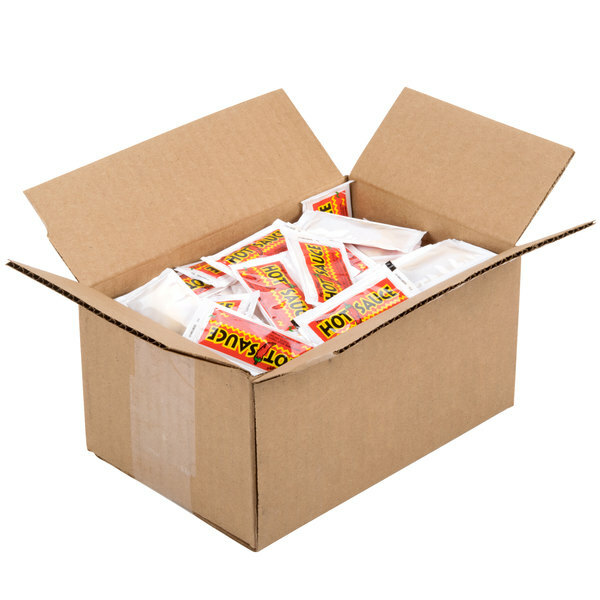 These portion control packets of hot sauce make for a delicious and convenient addition to your menu. 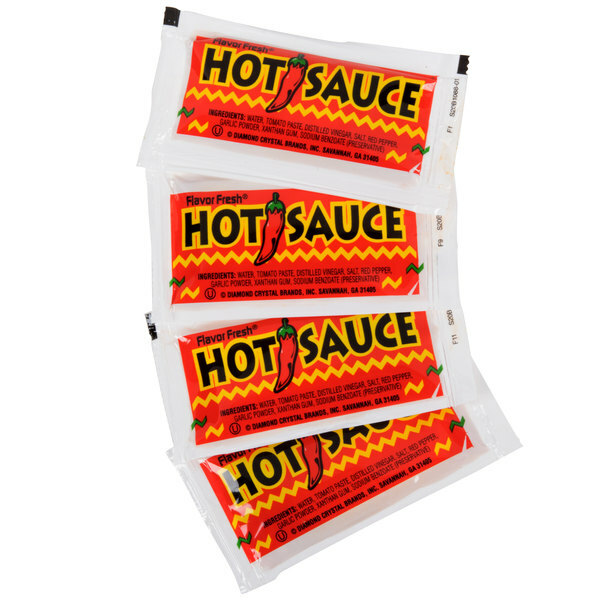 These is a great deal for hot sauce packets! The sauce it really good and has a nice kick to it. I would say it is about medium heat. These packets are perfect with the fried foods that I cater to my customers. They love that the hot sauce is individually packed and professional. Good flavor and excellent value. We use tons of hot sauce in our cafeteria and this works well. 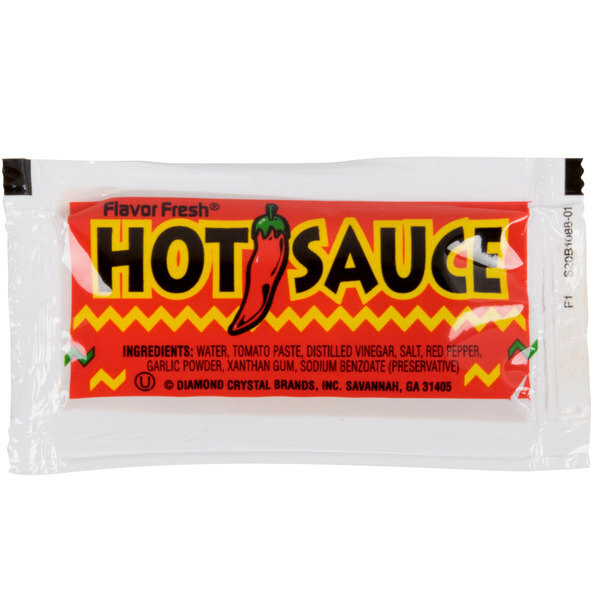 Excellent price and value for packaged hot sauce. Perhaps it's my love for hotsauce and all things spicy, but I really felt at the flavor could be a little bit more savory. It had more of a pepper taste as oppose to cayenne pepper which is spicy with flavor. This is a great tasting hot sauce at a great price. It does have a slight vinegary taste and could be a little hotter but for the price, you can't go wrong. I would purchase this again. I was disappointed in this product, it has a strong vinegar taste mor than spicy. Very mild and there’s less than a tsp in every pack. I would suggest another brand. A nice small packet style hot sauce that is bold and really will set your mouth ablaze. Great to kick up our bowl of turnips. A great tasting hot sauce that is really smokin'. The portion packet is great for a condiment bar or on the go use. A great sauce to use on hot wings. 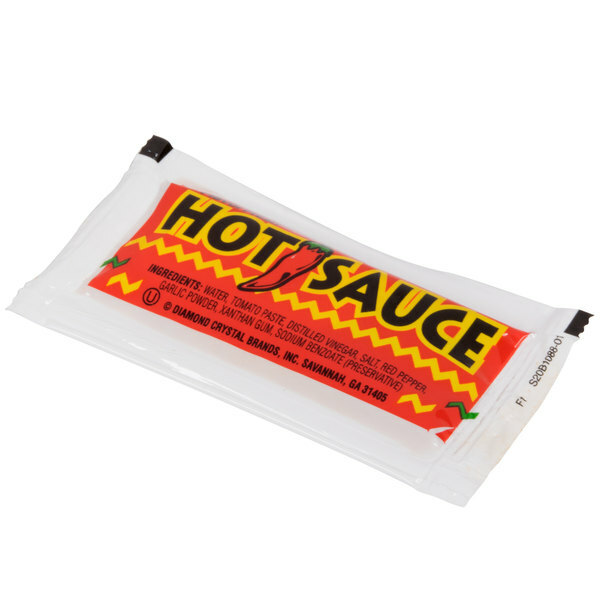 This hot sauce pouch has a nice spicy taste on it combined with vinegar. It has a nice combination and taste great with tacos. 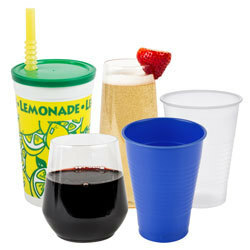 The portion pouch is great for food service!!! Even though I'm use to Franks Hot Sauce this is just as good. It has that kick that I always look for in pepper sauces. Basic generic hot sauce. It's not a name brand so it depends on your application. But if your clientele doesn't care it is a nice product. The hot sauce in the portion packets are great for our oyster bakes during the fall. The sauce has a great flavor and the perfect amount of spice. I love adding hot sauce to my soup and stews. I love the portion packets because there is the perfect amount in each packet. I love the taste and price. If you are looking for a milder hot sauce, this is a great choice. It tastes like Tabasco sauce with a slight taste of vinegar. The price is great and I have had no complaints. Very similar to Tabasco sauce, but not quite the same. It's sort of a weird mix of Tabasco and Louisiana sauce, but with none of the great qualities of either. This is just okay. It is not very hot. But for someone who likes it mild I would suggest it because it has good flavor.